Over the past month, I've been making a weekly trip to Dublin for blog events, press days or just for the craic. Although Dublin is only 2hrs away on the train, it was a city I rarely ever visited. But the more I have explored, the more I have come to realise how much it has to offer as an alternative to my home town of Belfast. A cronut makes the commute a lot more tolerable. I thought I would log a few of my snaps and finds in a post and my favourite places for shopping, to grab a coffee or for a quick lunch. One of my favourite new finds (well, new to me) is Indigo&Cloth. I've followed the store for ages in instagram so was determined to find it the day Caelan and I visited. Situated in the bustling Temple Bar area, it is coffee shop come men's fashion emporium come design haven. It's everything I want from a shop! With collections from Norse Projects, Levis, INSTRMNT watches, Our Legacy and Sandqvist, the store's carefully curated range is fashionable without being trendy. On each of my 3 visits, I have ordered a flat white. On each of my 3 visits, it's the best flat white I've ever had. I'd heard good things about Brother Hubbard when I put a shoutout on my facebook page for coffee spot recommendations. I made my way to it after attending the COS AW16 press day last week, one of the team at Baluba had actually recommended Brother Hubbard's other venture Sister Sadie but I was heading back towards the centre of Dublin so thought I should give the original a visit. A relatively simple installation, Brother Hubbard don't need to have over-the-top interiors when their food and coffee is as good as it is. I arrived *just* at the end of breakfast and was glad for it. I opted for the beans & pulled pork special, a hearty and warming bowl of homemade baked beans. spiced with paprika and topped with a juicy pile of pulled pork and a fried egg. While you're there, pop into their next door store Little Brother where all their delicious sandwiches (voted best sandwich in Dublin), coffees and essentials are available in a fantastic delicatessen. It's been a week since I was last in Dublin and I think I am having withdrawal symptoms; anyone got an excuse for me to go back? On Tuesday I headed down to Dublin to attend the COS autumn/winter 2016 press day. I had attended the SS16 press launch last year and really enjoyed getting a preview of the coming season. I much prefer the seasonal styles of autumn so I was eager to see the new collections. Much of the collection is purposely over-sized, with dropped shoulders and elongated sleeves or legs. This conscious free-form style is apparent throughout the menswear and womenswear pieces. piece. Any item can be combined, creating a versatile and functional wardrobe. Traditionally feminine shapes and colours have been applied to the menswear collection, created a free, androgynous selection. Soft creams and blush pinks will add a different cool tone to a winter look. The Japanese-influence COS is renowned for continues into this season, as seen in kimono-style collar-less over coats, this time in stunning off-white Donegal tweed. There is always a stand-out graphic print in the collection and this is it. A hand-drawn grid pattern, with a flocked finish, creates a modern take on a traditional overcoat. There is a running theme of utility, with fastenings, fabrics and details drawing from the realms of safety wear. Oversized zips, velcro closures, reflective fabrics and neoprene have all been used. A satin blazer is transformed by a thin layer of wadding, merging safety with sartorial. The Cos take on the classic white shirt and the polo neck; combining a jersey collar with a crisp cotton body. The simple placement of a dart or stitch changes the entire silhouette of a piece. This reflective sleeveless vest gives me a late 90's vibe. Reflective cycling safety gear applied to street-style casual wear. One of the few bolder colours was this pop of mulberry in a polo neck. Just the single feature colour against a pared back palette denotes a true sense of colour and style. Even the accessory selection was influenced by workwear and safety gear. Maritime duffle bags, felted snapbacks and these padded hand warmers. Thanks to Cos and the team at Baluba for the invitation. We are apparently now officially in spring however the April showers have arrived in abundance. But we can't let a bit of rain destroy our hope of a bright and sunny spring summer season. Last Tuesday I headed to Dublin to attend the Boohoo SS16 press launch. It was the first time I had attended any Boohoo event so naturally I was excited to see what was to come. I've shopped with Boohoo pretty regularly over the past 18 months, their selection of affordable, trend-led pieces are awesome wardrobe top-ups, especially for events such as festivals and holidays. Truthfully, I am not a big spring/summer kind of guy, I prefer layers and the colours and textures of autumn but I was too curious to miss out on the event. The BoohooMan spring edit was a mix of sportsluxe and utility. Traditional buttons were replaced with zips, lengths were exaggerated with the long-line trend still going strong. Mandarin and grandad collars were common across the collection, but used on unusual silhouettes. The colour palette stuck to the spring staples of white, blue, sand and grey. These neutral tones are hugely adaptable and work well with each other or with existing pieces in your wardrobe. 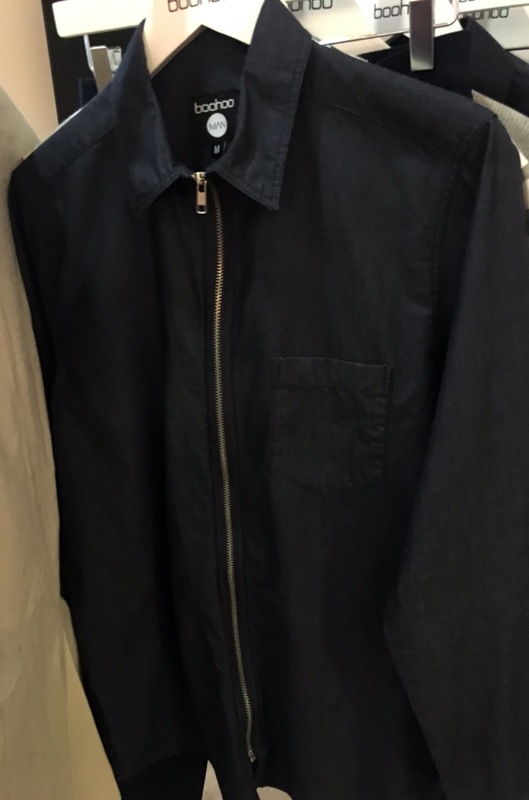 This lightweight shirt jacket caught my eye. The stone colour and contrasting fabric bomber collar creates a versatile and fresh alternative to the usual spring coat. Sports-inspired tailoring with panel details applied to crisp white shirts. One of the hero pieces is this fantastic long-line suede-effect tshirt in inky blue. Having some fun at the Boohoo #WeAreUs Polaroid wall. Watch out for the new season pieces filtering through over the next few weeks. BoohooMan has now migrated to its own site and to celebrate, they are offering 25% off (almost) EVERYTHING with code 25MENS.